More of the AD&D-intervention for places where Gygax fell down in the Dungeon Master's Guide. Today: Outdoor Movement. Advanced D&D, Dungeon Master's Guide: Here's the Outdoor Movement table for AD&D. Looks okay at first blush -- but try using it directly in-game. The numbers aren't evenly divisible by any common map scale (in fact, they can't be, except for a scale of 1 space = 1 mile). When I was playing with my books as-written all through my teenage years, I was constantly making little dots all over maps, trying to track party movement in fractional-hexes. Like if you were traveling with average gear through the woods of the World of Greyhawk (30-mile hexes), then I was making little 1/3-hex marks for every day of travel. Or if you were exploring the mountain wilds of Gygax's Dungeon Module S4: The Lost Caverns of Tsojcanth (3.5 miles per hex) on heavy horses, then I was trying to make a mark every, um, 1.43 hexes or thereabouts. And worse: This doesn't even start to account for crossing multiple kinds of terrain in a single day, which technically would require pro-rating the movement in one region and calculating a proportion for what's left over for the next. Also: The terrain categories are abstracted, and looking at any map you've got a two-step process to convert terrain to general category to movement rate. And the carrying-weight burdens (given after the table) don't even synch up with the regular encumbrance categories seen elsewhere in the rules, either. It's a hot mess, I tell you! Aha, now that's a lot more useful for gameplay! The terrain types are immediately keyed to what you see on the map, and they're given in whole-number costs to enter a hex. It's so obvious, really. You never need to deal with partial-hex movement, and cross-terrain travel is handled by simply deducting each hex-entry from an overall move-per-day. Very simple and manageable, and scaled to the gameplay at hand. So the overall mechanic is the same as Outdoor Survival (with some smallish adjustments). All travel is given a daily move-budget, and it's expressed directly in terms of hexagons on the map used in play. 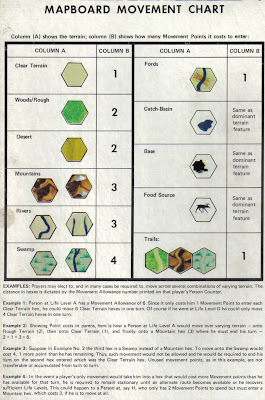 "All terrain penalties are as stated in OUTDOOR SURVIVAL", with adjudication done by paying for movement as each hex is entered (although swamp and mountain trail movement are given different values here; and note that no one's mentioned hills yet). Now that's immediately playable. Also note also that the scale is different ("about 5 miles"), which is likely an intentional change, although it's not explained why (perhaps to cover more territory while adventuring?). It's approximately a doubling of scale, and the man-on-foot travel rate is correspondingly halved (3 hexes, instead of Outdoor Survival's base 6 hexes). So those are pretty much the same (i.e., that's where the DMG numbers really come from), excusing some slight rounding in a different direction here and there. With one noticeable exception: The "very rugged" rates for movement on horseback are all further reduced a great deal, which is a fairly realistic handling of how horses fail to be useful for mountain-climbing purposes and the like. (I like this latter point, even though it was left out of later editions like B/X and 3E; I honor the idea in Book of War by doubling all move penalties for mounted troops). Right. So the DMG Outdoor Movement table isn't really intended to be used directly in play in the first place. You're supposed to "adapt them to the scale of your campaign maps accordingly. Some variation in movement rate is justifiable..." Or more directly stated: Take this as raw source material, and make your own table by dividing the numbers by your hex size in miles, rounding to the nearest whole number. Wow, that seems super-important now! Recommended: The AD&D DMG Outdoor Movement table is acceptable as a starting point for wilderness play (it seems in-line with real-world research), but you have to do some derivation work. As we just stated: Divide the numbers by your hex scale and round off. Just do that with the "normal" terrain numbers, and in play assess costs of 2 hexes for rugged terrain (woods/hills) and 3 hexes for very rugged (mountains/swamp); payment is made as each hex is entered. Horses should be further penalized in very rugged terrain, perhaps most simply by just prohibiting movement altogether (unless map hexes are very finely grained). For example, at the start of this week, I made a large-scale campaign map at a scale of 15 miles/5 leagues per hex (in fact: doing so is what motivated the series for this week). Here are the appropriate derived movement rates: 4 hexes/day for light horse, 3 for medium, 2 for foot/heavy horse/cart or wagon. Movement off-trail into a woods or hills space costs 2 points (i.e., halved; 1 hex on foot etc.). Travel through very rugged terrain -- like mountain climbing or a dread swamp -- is not appropriate at this particular scale, and should be shifted to a more zoomed-in map, with its own characteristic movement table (again taking the DMG table as a starting point). Coming from a board wargame background, I started using a wargame-like movement point system as soon as I realized you could translate the concept to RPGs (embarrasingly late in life). 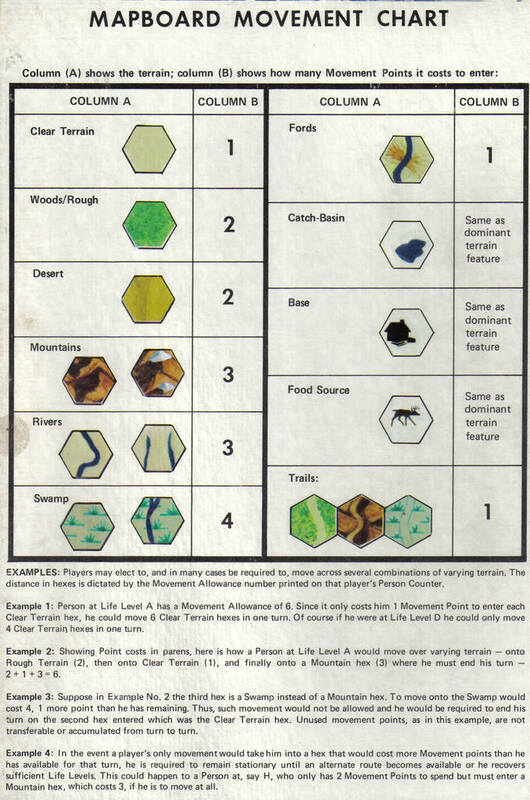 I remember being frustrated by how to run wilderness adventures when I was a kid. The movement rate tables in the DMG (and even in the Cook Expert book) were part of it, I think. A larger part was the lack of solid examples of how to run a day or a week of adventuring on an overland map. I felt fine running dungeons when I was young because I had concrete examples to fall back on (this goes all the way back to OD&D, with its "playlet" format that became standard), and fairly well-defined rules for adjudication. Wilderness adventuring had no such equivalent. Cook Expert, for example, gave an equipment list a party might draw up for an overland treck and provided a sample wilderness map. You also got some rules for getting lost, etc. But there was little help for the newbie in determining just how everything was supposed to work together. This wasn't just limited to how to reconcile movement rates with partial hexes; what effect would not having sufficient rations have, for example. The questions just seemed to crop up for me, and it was intimidating. I did not feel comfortable running wilderness treks for years because of this; I'd handwave travel instead (with maybe a set-piece combat or encounter with merchants or something), which was never really satisfying to me. ^ Ken, that's a really excellent point. Thanks for writing that. Does 3e or 4e even have rules for overland movement? Ship to ship combat? It's like character creation gets more and more complex and the things the characters can participate in (outside of DM fiat narrative play) dissapears. What good is making your character a super detailed swashbuckling-pirate with a PrC ship captain if there are no way for a dm to do anything but "hand wave" all the action? I was looking at this topic today and noticed that on page 102 of the AD&D Players Handbook that there is another completely different set of rules for overland movement that match the ones from the Cook Expert set. ^ Yeah, that is a good point ("Each 1" equals the number of miles a character or creature can travel in one half-day's trekking."). It's kinda-sorta on the same scale as the DMG numbers (granted "normal" terrain), but you're right that the specifics are different by a bit. Very interesting post... in '75/'76 in south Louisiana we weren't using Avalon Hill's game (and I only recall the very back of Chainmail, by the time I was DM'ing it was all Dungeon and ACS) so this look at "Outdoor Survival" has been very illuminating as we played the Phil Barker rules for miniatures so Chainmail never got used for mass combats or historical battles. So... have you seen The Fantasy Trip? S.J. looks like he flipped the script... like actually took the AD&D sequence and reversed it... thought you might be curious if you haven't noticed that one. Interesting! No, I haven't had a chance to ever see Steve Jackson's The Fantasy Trip... so that's educational for me to hear how that's related, thanks!